Cultural Landscapes Blog›How is restoration relevant to stewardship? At the turn of the century Jessica Brown and Brent Mitchell (2000) described Landscape Stewardship as “usually thought about in terms of the essential role individuals and communities play in the careful management of our common natural and cultural wealth, both now and for future generations”. This was more contemporaneously expressed by Jianguo Wu (2013) as a “place-based, use-inspired science of understanding and improving the dynamic relationship between ecosystem services and human well-being in changing landscapes”. Both of these views strongly emphasis the role of people in landscapes, as key elements of their stewardship. Wu’s quote also embraces the ecosystem service paradigm more familiar in the second decade of the century, whereas the earlier quote emphasises natural and cultural wealth. But all seems linked to the maintenance of landscapes as they are, although Wu does use the word dynamic. So what’s the relevance of restoration in stewardship? Simply put; we are no longer able to just “preserve” landscapes (or biodiversity at finer scales) as if they were Jams and Marmalades, as Gary Larson (1989) once wickedly suggested! - Policy options include community-based projects, carefully designed restoration projects, and/or appropriate management of novel ecosystems, economic incentives combined with public participation, and effective monitoring and enforcement. Restoration is often viewed as returning a landscape or ecosystem to a previously functioning “natural” state. Yet more and more this is impossible, as landscapes are increasingly a matrix of ecosystems or “biodiversity patches” modified in various ways from an observed, or frequently presumed, original state. This landscape matrix, although it may be ecologically sub-optimal, can, and does, deliver a range of ecosystem goods and services; for people, but also for adjacent landscapes/ecosystems. It should also be recognised that landscapes which have been changed can either “self-restore” or move to a new state, depending on the prevailing ecological conditions. Management challenges and opportunities presented by these landscape matrices encompass how the degree of modification affects broader-scale processes e.g. eco-hydrological activity, gene flows, cultural perceptions and interactions, animal movements between adjacent or far-distant landscapes etc. Some landscapes which look (and are appreciated) as natural today are in fact restored or reconstituted. The Isle of Man has many National Glens, which are well forested, and most visitors and many locals see them as natural. Yet most have been deliberately restored to wooded valleys during the early part of the C19th, to attract tourists. A minor consequence has been that such afforestation (often with species that may have been present, or maybe not), has allowed the rich bryophyte and lichen flora to flourish. 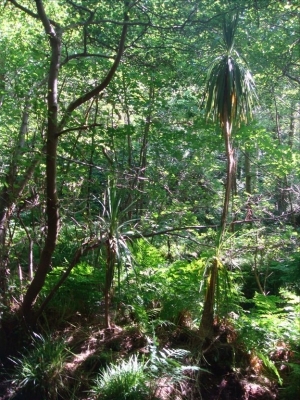 The photograph (© Peter Bridgewater) is from Groundle Glen, showing the dense understorey – and a surprise component in Cordyline australis- widely grown in gardens across the island, but here established, apparently adventively. All this means any stewardship plan for such landscapes must include inclusive development of conservation, restoration and management strategies that comprehend rapid spatial and temporal change, and reflect the complexity of the current landscape patterning. Which brings us back to the definition of landscape stewardship quoted at the outset – stewardship is very much about management, recognising that change is inevitable, and embracing and managing for change where that seems preferable to simply leaving things as they are. Above all using restoration as part of landscape stewardship is also about being prepared for surprises and adapting to the new, while valuing the old, where it is still sustainable so to do. Jessica Brown and Brent Mitchell. 2000. The Stewardship Approach and its Relevance for Protected Landscapes. The George Wright Forum. 17. 70-79. Richard J. Hobbs et al. 2014. Managing the whole landscape: historical, hybrid and novel ecosystems. Front Ecol Environ 12. 557-564. Larson, G. 1989. Wildlife Preserves; Far Side collection 10. Andrews and McMeel, Kansa City, Mo, USA. Wu, J.G., 2013. Landscape sustainability science: ecosystem services and human well-being in changing landscapes. Landscape Ecology. 28. 999-1023. I would like to reprint this post on my web site...http://livinglandscapeobserver.net.